New York State in the 19th century was a model of enterprise and progress. Manhattan was rapidly becoming the cultural capital of America and the Erie Canal was bringing commerce and prosperity west of the Hudson. But St. Lawrence County, between the Adirondacks and the St. Lawrence River, remained as it had always been, an isolated collection of roughshod farm communities. 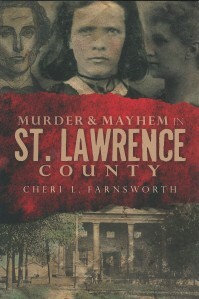 In Cheri L. Farnsworth’s new book Murder & Mayhem in St. Lawrence County, it is also a dark and dangerous place filled with sensational crimes and deranged killers. The book contains twelve intriguing stories, true murder cases from New York’s North Country in the years between 1816 and 1917. In method and motive the killings mirror what was happening throughout America—from premeditated poisoning for inheritance to impulsive axe murder during robbery. And of course, there were shootings, stabbings and slashings out of jealousy and passion. Especially striking is the number of murders involving lovers, spouses and immediate family members. James Eldridge poisoned his fiancé; Frank Conroy slashed his wife; John Hall shot his brother-in-law; the list goes on. There are stories of senseless violence as well; including a man who shot three people while “seized by an urgent sexual frenzy.” Adding drama to the collection is the fact that in one case the wrong man may have been executed and in two others the murderer was never found. Murder and Mayhem in St. Lawrence County is well-researched, drawing from trial transcripts and other primary sources. Excerpts from local newspapers of the time and an abundance of illustrations and photographs (many from the author’s own collection) add authenticity to the descriptions and provide the reader with a true sense of the setting and characters of each story. True crime reporting can be an effective tool for exploring the everyday history of a place and time. Murder and Mayhem in St. Lawrence County illuminates the dark side of northern New York’s early days. This is a very good book. I love books about historical crimes in different areas or cities of the U.S. I just recently bought Murder & Mayhem in Jefferson County and can't wait to read it. Good writing, interesting material and a bit of occasional humor. I recommend her books. I also have M&M in Essex County, and loved it too. Thanks to both writers and I hope there will be more.